Thanks a lot Carsten for this new version !!! Nice to see your still working on Calimero, and adding more features to it, but the text handling (one of the most basic functions of a word-processor, or a 'powerful' DTP program) is still not fixed, and so trying to navigate through a document using the cursor keys is virtually impossible, and you have to click wherever you want the cursor to be with the mouse to be in with a chance to get it to offer an edit into the document where you need it. The hyphenation dictionary option also does not seem to work correctly for GB dictionary, as I type the word 'occasions' in, and I get 'occasio' on one line and 'ns' on the next line - with no hyphen at the end of the line to indicate the word has been 'split'. In fact, I saved it in that state as a TXT file, and when I reloaded it there is the text/few characters "="r5" at the end of the text that wasn't there when I saved it as basic TXT, so what is going on there. I got a "Ö" on one occasion instead of the above few characters, but the next time I loaded the document the extraneous characters were gone, which is totally unexplainable to me. I have been able to save some text as a PDF and other documents, so the program is improving, but the basics are still a long way off being what they should be, sadly. Why can Calimero only open one document at a time? If you need to load a document then sometimes you need to load a previously saved document to import some text from that additional document to paste some of the features of the document into the other, which you cannot do with Calimero in its current state. You would think that by the revision point of v3.5 it would be mature enough to cope with all of the above simple features without making a mess of them, or being incapable of doing them. I want this program to succeed, but either you need help from someone else to get the program to do what anyone should be able to expect from it, or you need to sit down, and fix them yourself. I don't want to be putting you off improving this program, but it is not really that useable in its current state, sadly, and I certainly would not want to rely on it for DTP or word-processing, in fact I'd rather write the text in the forum pages, and then past it into Calimero, and hope it gets interpreted and set-out correctly on the page, in the way it is in this basic text-editor that Calimero does not seem to be capable of. Why can Calimero only open one document at a time? Ok. Calimero's editor haven't much features, but i work on that. First new step is the hyphenation on lineend. That's work with hyphenation dictionarys from OpenOffice. The Second step is the including of the "new" feature of the spellchecker.library. Thats make it possible to "train" the spell dictionary. Third new step is a "Spedup". The keyboard input works much more faster than before. 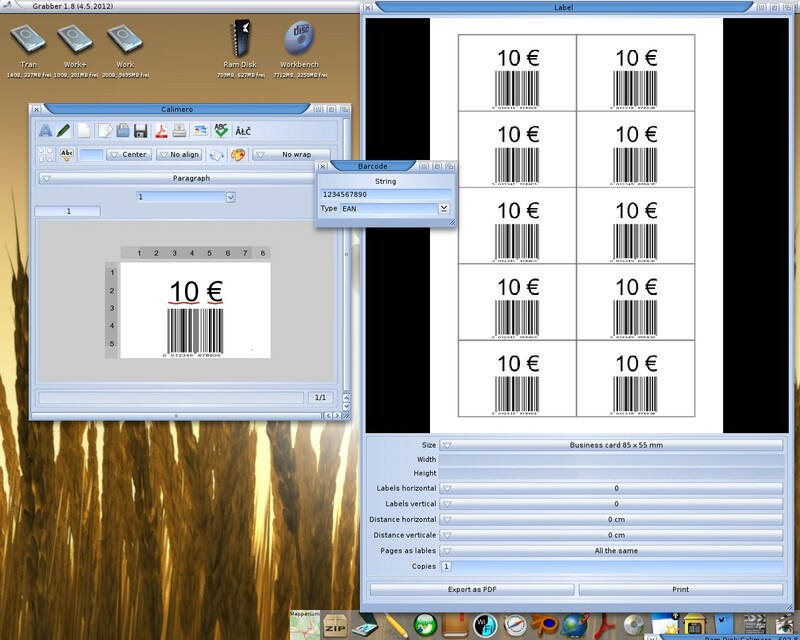 Now MorphOS is the only other system, thas support barcodes at editor level. Only Windows have support it before. 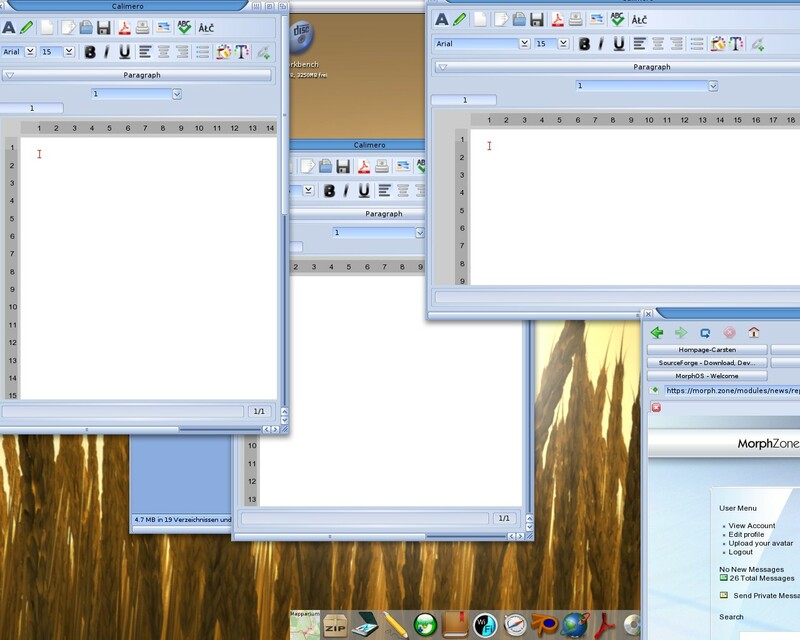 Calimero - Do you know about the new DTP Program for MorphOS ? pegasos-sigi2: Why can Calimero only open one document at a time? I am talking about running the program on it's own screen, and trying to initiate a second document to open on that screen in addition to the first one, which seems to be impossible as far as I undertand the process of the program, running as one instance, unless you can explain it to me differently, as I am happy to learn if it is possible? I believe you are running the Calimero program 3 times to be able to do that, instead of them being stacked in just one run of the program, inside the same GUI, although if not then I'd like to know how?. pegasos-sigi2: Ok. Calimero's editor haven't much features, but i work on that. That would truly be great news, and the sooner the better. pegasos-sigi2: First new step is the hyphenation on line-end. That's work with hyphenation dictionarys from OpenOffice. Sadly it is not working for me, and I downloaded the OpenOffice GB hyphen dictionary and put it in the dictionary folder, but it does not seem to be doing what you are saying it should, more is the pity. pegasos-sigi2:The Second step is the including of the "new" feature of the spellchecker.library. I noticed that, and it is a nice feature, which is more inline with the everyday functionality of a wordprocessor - so yes that seemed to be working as you hoped it would - well done. pegasos-sigi2:Third new step is a "Spedup". The keyboard input works much more faster than before. I noticed that as well, and that too seems to be an improvement, but it is the basic moving around the text that needs fixing as a main priority as it's a wordprocessor function, and it's just not functioning as anyone should expect it to, which is why I mention it. I don't use barcodes when I'm writing a letter or document, but I can see there is some usefulness to it, and it is maybe more important to you than to someone else, so it is obviously beneficial for you to have that feature, so well done at implementing it. Do you download it from my link ? In Calimero you must select this file in the settings / program / spellchecking /Hyphenation. After that you must save tihs settings, and restart the prog. The dictionarys can't change on runtime. So they was loadet at the start. I test the file "hyph_en_GB.dic" and it works correctly for me. Do you know about MUI 5 features ? On every Calimero on this screen you can take a differend work with a different document. You can copy/paste text and whole object groups between one Calimero and all others. This is a MUI feature, and i wont't integrate it a second time in Calimero. NewSense: I am talking about running the program on it's own screen, and trying to initiate a second document to open on that screen in addition to the first one, which seems to be impossible as far as I undertand the process of the program, running as one instance, unless you can explain it to me differently, as I am happy to learn if it is possible? Which MUI 5 feature are you referring to, as there are quite a few? 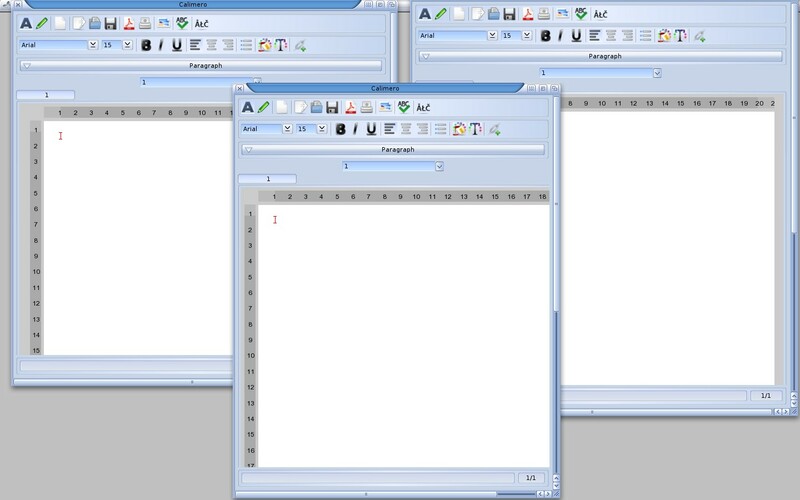 I can see 3 windows, but they seem to each be in their own GUI frame, as though the program has been run/executed 3 times, and the programs put onto the same screen, which is not the same as allowing one execution of the program to then allow futher documents to open within the same execution of the program/screen/GUI - by way of example, such as you get with Scribble which allows a further text to be loaded as an additional TAB in the same GUI, within the single execution of the program, but as the additional TAB as a further spawned frame. Basically all I can say is, you seem to be missing my point, that's all. pegasos-sigi2: On every Calimero on this screen you can take a differend work with a different document. What the problem ? You can copy/paste text and whole object groups between one Calimero and all others. This is a MUI feature, and i wont't integrate it a second time in Calimero. Obviously if you will not consider my sensible request because you don't want to implement it then that is a matter for you, but it would enhance the program's features, but as I say, that is solely a matter for you - I am only asking, and mentioning it because I don't see the feature in Calimero, a feature that is missing which is worthy of mention. For other users info: It will require you to go to the Open Office link, supplied in this thread by pegasos-sigi2 for the dictionary, and click on whichever dictionary you want, which then opens in a browser window with the RAW dictionary in a window, so then highlight/select, and copy the page of the dictionary as data, and then transferr it, by way of 'Copy->Paste' to Scribble/NoWinEd or some other Editor, and then save the dictionary as a 77k file, saving it as the same name as on the link in the same format name/wording as for the US and DE version of the hyphen dictionary. Also, when I try to centre justify a paragraph then I lose the top 2 lines with a red rectangle 'bleeding' into the left margin, and if I right justify the paragraph then I lose all but the top 2 lines, with the same red rectangle bleeding into the left margin area, adjacent to the page area. The text features of the program really need to be 'knocked-into-shape' - i.e. fixed, before you add more features. Additionally, when I click on Snapshot a window in Calimero, to save its position and dimensions the program does not save those features of let's say for example, the Settings Window, as when it opens from initial loading you can only see the first letter of each setting, so I extend/increase the size of the settings window, so I can see the title of each setting, and then I click on Save but when I re-open the Settings window it is back to just the first letter of each setting being visible, surely that cannot be as you intend it to work? Initially when I saved "hyph_en_GB.dic" in the program Settings window, those settings didn't get saved, and it reverted back to the US hyphen dictionary, but somehow I seem to have managed to get it to retain that option for the moment. You have in the Settings TAB Options, System, but on that TAB there is only one item 'Cpu Usage', with a 'button' with the word 'Level:' in it, but it does nothing, so what is the purpose of it - the System TAB? Also on the Settings 'Drawing' TAB under Potrace you have an option 'Turdsize', well I don't know what research you've done on the English equivalent of that phrase but it would be like typing in Deutsch/German "Scheiße Größe"! So maybe you need to consider changing the name of that option. In fact the Settings window has options, but as the window sometimes is too small to see all the options the Save Use Cancel options are out of view, and it is not that obvious how to get to them, as there is no scrollbar on the right hand side, that any user might expect to see in any window/requester of this type, so would be an advantage to add it for everyone's benefit. I know it can be scrolled with a scroll wheel capable mouse, but it is not obvious. I also notice that clicking on Save, in the Settings window does not then close the window, in fact neither does 'Use', the only one that does is 'Cancel' so that would indicate to a user that they cannot save a feature/setting only Cancel whatever they try to alter to suit their own needs. I could go on about other shortcomings related to the program, but if you could fix the ones I have mentioned that would be fantastic. Why other people have not mentioned any/some of these problems with Calimero to you already is beyond me, as you need to know they exist to be able to fix them. Is there anyone doing any Betatesting for you? I will do so if it is of any value to you. Anyway, I wish you success. It should suffice to right-click the "Raw" link above the file data and "Save as" the file, or view the file by left-clicking the "Raw" link and then "Save as" the file. > "Scheiße Größe"! So maybe you need to consider changing the name of that option. You better take this up with the Potrace author. - suppress speckles of up to this size (default 2)"
The solution: Click on the link with the suffix ".dic". in the now opening webside move your cursor to the link "raw" and open now the contextmenu. Select "dowload linked file". Includes this lines soft linebreaks? Do you try to center a wraped line? This did't work in Calimero. Only lines with a hard linebreak (a linefeed with the CR Button) works. So its working for me: Snapshot the main window. MUI memorised only this window. All oher (11 sub-windows) are memorised then , too. That's correct. The reason: This settings are obsolete. 1. The settings for memory usage are not needet any more, because now Calimero allocate and frees memory space dynamicly. No user interaction is needet. 2. The same as Task cpu usage. Now Calimero starts the render tasks in wait stait. The wait stait use 0 % CPU time. Only on a notify from the main task, starts the render task and going after work in the wait stait again. To pegasos-sigi2: First of all I should say that your method of replying to threads is sometimes difficult to get through, due to the method you use to 'quote' or 'highlight' some reply, with some of the comments unreplied to, but quoted, and by using up inordinate amounts of space to make your reply. It would be beneficial to me, and probably many other users, if you would consider using quotes succinctly/briefly, and not use too much space between quotes to make your reply, as that would be very helpful, and appreciated, and is as most repliers seem to do, as do I.
I should also add . . . thanks for your quick reply, much appreciated. NewSense: Which MUI 5 feature are you referring to, as there are quite a few? I am still waiting for a reply to this question you posed. NewSense: I can see 3 windows, but they seem to each be in their own GUI frame, as though the program has been run/executed 3 times, and the programs put onto the same screen, which is not the same as allowing one execution of the program to then allow futher documents to open within the same execution of the program/screen/GUI - by way of example, such as you get with Scribble which allows a further text to be loaded as an additional TAB in the same GUI, within the single execution of the program, but as the additional TAB as a further spawned frame. Basically all I can say is, you seem to be missing my point, that's all. I am still waiting for a reply to this question I asked. pegasos-sigi2: Includes this lines soft linebreaks? Do you try to center a wraped line? This did't work in Calimero. Only lines with a hard linebreak (a linefeed with the CR Button) works. 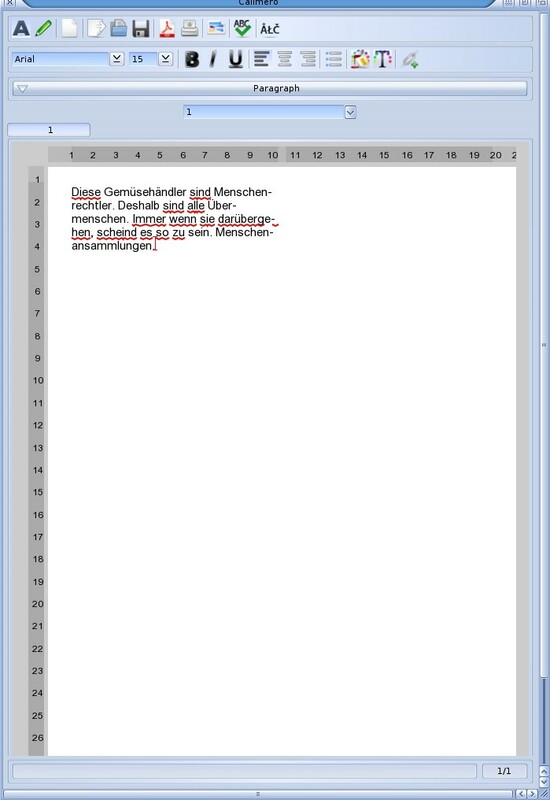 Are you saying that if I write a paragraph of text, and allow the program (Calimero) to format the text as a normal paragraph, but then decide I need it to be justified (where the text on a line even if the words don't reach the end of the line of text are then spaced to reach both margins on the page, - or does Calimero only do Centre Justification?) has to be input with a [CR] at the end of each and every line of that paragraph, if so, you should really re-think that process, as you cannot expect users to have to go through that laborious process every time they write a document, or even only offer centre justification instead of true justification. Having said that, it's your program to do with as you wish, I am just asking you to consider a reasonable request, even if it has to wait for some time for consideration of being implemented. An undo and redo function, with an option to allow multiple undos/redos in the settings, would also be a good feature. pegasos-sigi2: So its working for me: Snapshot the main window. MUI memorised only this window. All oher (11 sub-windows) are memorised then , too. Sadly that is not what is happening for me, though I would appreciate other users contributing with their analysis of using the program, to see if other users are having the same issue(s).